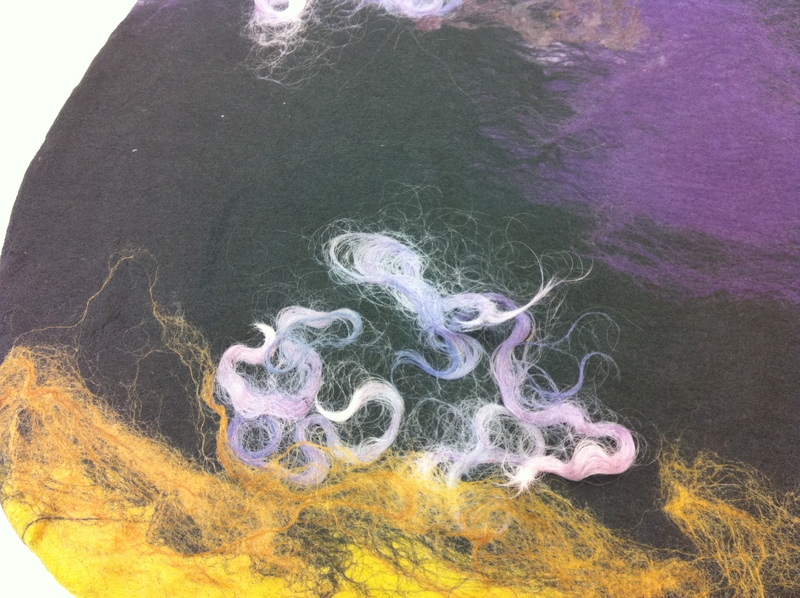 THANKS and pictures of the beautiful felt created at the KIA workshops! I’m home safely at last and bowled over when I look back at all the pictures I have taken over my whirlwind felting trip to the US. Four weeks sounds like a LOT of time to spend on the road but in actual fact the time just whooshed by although I lived every minute to the best of my ability and LOVED every second spent with fibre friends both new and old! It’s just not possible to thank everyone who contributed to my wonderful experience individually on the blog and I would hate to leave anyone out unintentionally so to everyone who made me feel totally at home and SO welcome everywhere I travelled THANKS!!! Thanks to all the organisers, hosts, friends, workshop participants and blog followers who really made the trip so special and thanks to everyone who gave me unusual gifts along the way, fibre, chocolate, rolling mat, sequin waste, artificial fabric, inclusions, fabric, vintage trimmings and other little items either difficult or impossible to get here in Ireland. I love them all and hope to show you pictures here as soon as I start to incorporate them into my felt over the next few months although in case you are wondering I am eating the yummy chocolate, some things are just a step to far when it comes to adding inclusions! Now for some pictures as promised from the fantastic complex bag workshop at the Kalamazoo Institute of Art, pictures to follow tomorrow from the felted accessories workshop and then over the weekend pictures from my visit with Dawn and my trip to the Sheep and Wool Festival in Rhinebeck with Heather! 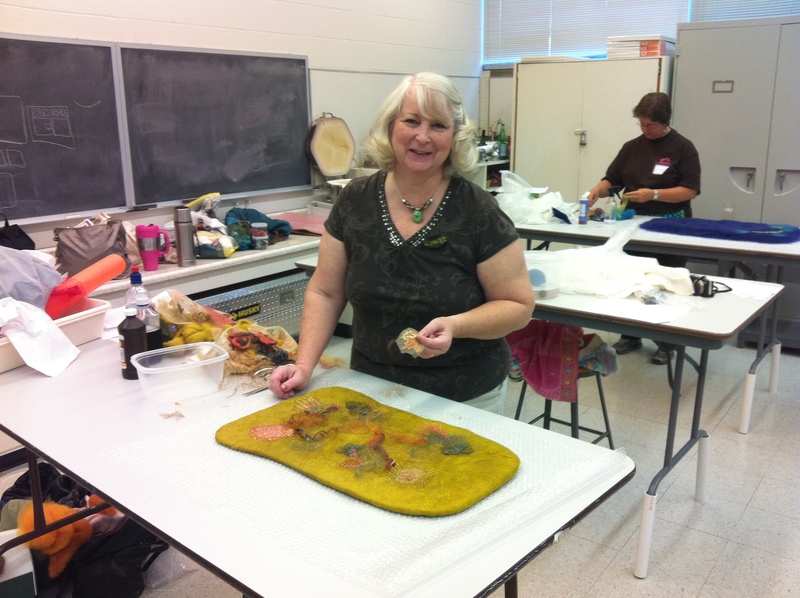 Booking open for my felting workshops in Michigan this October! Booking is now open for my ‘Complex Felt Bag’ and ‘Felted Accessories’ workshops at the Kalamazoo Institute of Arts in Michigan on 9th, 10th and 11th October! I am so excited to be finally getting everything together for my American trip and this is just another milestone towards a totally fantastic fibre filled adventure!!! Yesterday I booked all my international and internal flights (Dublin to San Fransisco, San Fransisco to Grand Rapids, Grand Rapids to Philadelphia and New York back to Dublin) and it is just going to be so exciting to meet as many of my blogging felting friends as possible during the 4 weeks which I will be spending on the road. Dawn Edwards (of the wonderful hats fame!) has been brilliant setting up the Michigan leg of things and I am so looking forward to spending time with her both at the workshops and during a planned visit to felt with Horst of Horst Couture, I am almost expiring with excitment as he is one of my all time felting idols!!! Anyway, I thought that for today I would just let you know what is planned for Kalamazoo so that if you are interested in joining us you can book to be sure of your place, below are the details taken directly from the Institute of Arts website. Saturday and Sunday, October 9 & 10, 9 a.m.-5 p.m. Note: Community registration begins August 11. Materials fee to be paid on date of workshop. A $30 (approximately) materials fee will need to be paid on date of workshop. Participants will begin by creating a small piece of jewelry imbedding glass nuggets or stones within our felt and using natural or artificial fabric for surface decoration and texture. There will be discussion of the various options for felting bags with integrated handles, multiple pockets, flaps, attachments and shapes and looking at the various ways the bags may be adapted to be used as handbags, shoulder bags or backpacks. Participants will learn how to either stitch or stick resist materials together to create the templates and then make a sample piece using layers of merino and C1 wool or similar coarse wool. 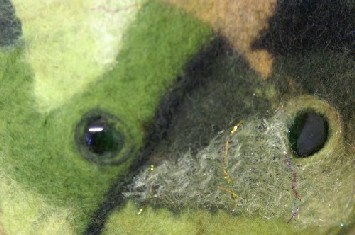 Continuation of felting and finishing the bags will complete the workshop. Bring a sack lunch, materials list available on the web. Monday, October 11, 9 a.m.-4 p.m.
Materials fee to be paid on date of workshop. A $27 (approximately) materials fee will need to be paid on date of workshop. This workshop will allow participants to experiment incorporating found objects, glass nuggets, stones, fabric, leather, fish skin and any other kind of inclusion in make unique wearable accessories. Each person will create a combination of rings, bracelets, necklaces, brooches, scarves, simple belts, purses, neck wraps, sleeveless mittens, or flowers. Nicola will bring a selection of unusual fabrics with her from Ireland including metallic meshes and sequin or glitter studded polyester, for participants to use. 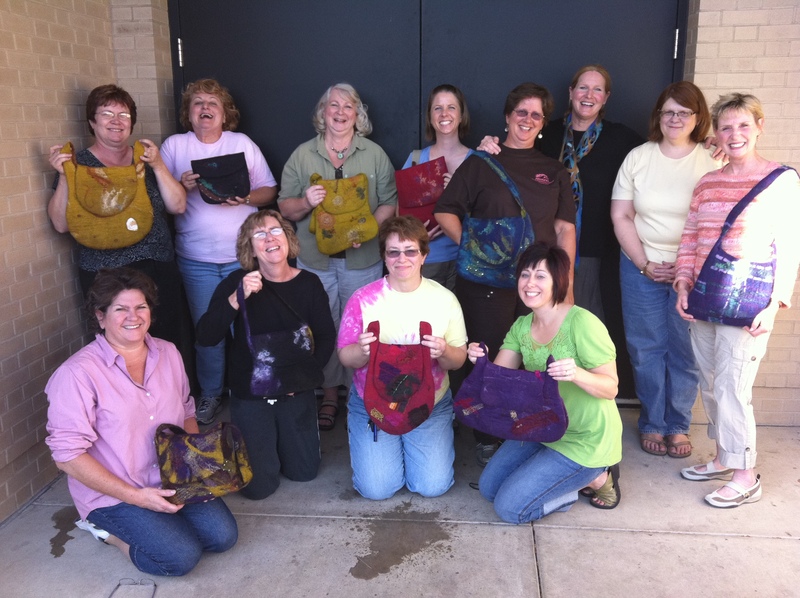 Bring a sack lunch; materials list available on the web. To book either or both workshops please scroll down to the bottom of this page and click on the relevant link! 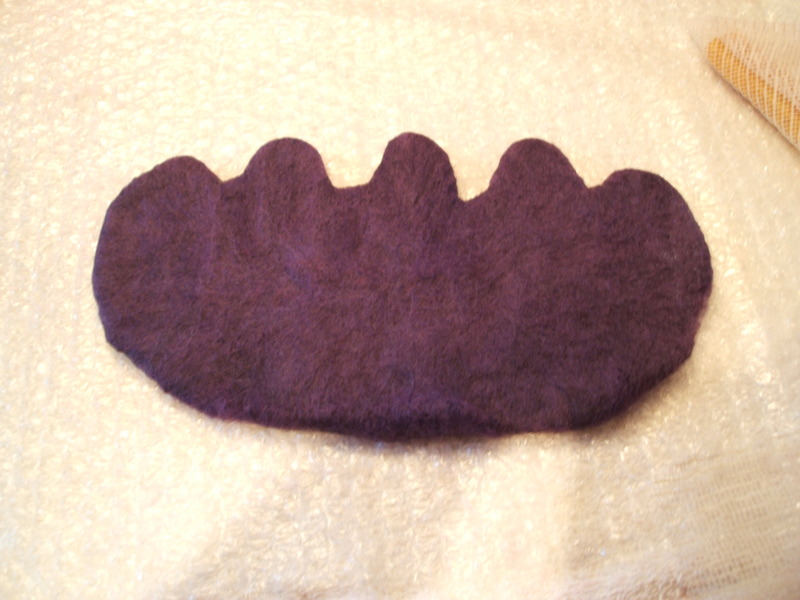 Well, I shouldn’t have blogged the other day about the creative juices somewhat flowing because that just seemed to jinx things and it has taken a long time to get my new bag designed and felted! I wasn’t happy with the initial sample (the one in various shades of orange, yellow and gold) so decided to make a large piece of prefelt from different proportions and stripes of cerice, turquoise and black merino overlaid with black and gold artificial lace, glitzy but subtle when fully felted. This prefelt I then cut up into various shapes before felting it onto a base of apple green merino, another disaster! In this instance I didn’t like the contrast between the different prefelt shapes and the clarity of the green when felted, by this stage I had spent a full day and a half without being happy with any of my samples! Running in tandem with this very frustrating process I kept adjusting and fine tuning my template until at last I was happy with the shape of the proposed bag. Eventually after some more dithering and debating I decided yesterday afternoon to just get on with the bag using colours that I often combine together (no sample this time! ), black with small amounts of light and dark turquoise. The front of the bag has inserts of textured leather and the back a few glass beads which I hope to stitch or bead around. Now that the bag is fully felted I am actually thinking of entering it into an Irish craft competition so probably will take some shots of various details to upload here but not post a picture of the whole bag until the entries have been short listed. Handles for felt bags seem to be a topic that many of you are interested in at the moment. For myself I like one of two things, either a felt handle integrated into the bag itself or a handle made from another material altogether, leather, metal or wood being three excellent choices that jump to mind immediately. Contrasting materials and textures bring excitment to felt so keep your eyes peeled to see what unusual items you may come across that could be put to good use as a handle. I also like my bags to have a couple of different options for use if at all possible, handbag, backpack and/or shoulder bag all rolled into one. To this end I sometimes incorporate a loop into the back of my bags, this may then be strung with a long felt cord to form a backpack although obviously it depends on how the integrated handles are incorporated if this is to work successfully. Now, how to integrate rolled felt handles so that they are totally strong, don’t stretch, will stand up to practically any hardship and most importantly last for many years! For strong sturdy sculptural bags the alsolute best method that I have ever used is what I learnt from Lyda Rump at Felt in Focus in Denmark last summer. Felt your handle/handles totally until they are extremely hard and there is no shrinkage left leaving all the ends dry. Lay out your bag in three layers, layer 1 merino, layer 2 a strong and coarser wool such as C1 or Icelandic and layer 3 merino again. Wet and soap lightly between each layer and after you have laid your second layer fluff out the dry ends from your handle/handles and place into position. Don’t forget to allow for the fact that your bag will shrink, the handles should not shrink any further or only a very small bit if they are still a little soft. This is why it is so important to felt them extremely firmly before inserting them! Cover the dry ends with a little more of the wool from layer 2 and needle lightly into position. Continue to lay layer 3 followed by your surface decoration and when you start to felt your bag pay special attention to the ends of the handle/handles and make sure that they felt into place exactly where you want them to end up. As your bag felts and gets stronger pull and rub at the base of the handles to make them extremely strong and well integrated. Another great method for handles is to cut your resist out but don’t actually remove any felt. You then need to stretch the opening in such a way as to form your handles and then felt them fully. Both Elaine and Carmen’s handles were formed in this way at our recent complex bag workshops and loads of books on felting give different ways of cutting to achieve this result. Have a look at the images of Elaine laying out her wool (from my recent posts) and then her wearing the finished bag, this should give you an idea of what I am talking about if you don’t have any suitable books. Sunday was the second and final day of our complex bag workshop and the end of three brilliant days felting with Lyda Rump. Because Cristina and I had worked well into Sunday morning to complete our bags we had a great opportunity to try something else whilst watching Elaine and Carmen’s bags taking shape as they felted and fulled. I decided to make a small felt vessel which had been in my mind for a while and Lyda showed me how to design the template to give me the result I was aiming for. Sometimes another brain or a bit of lateral thinking makes all the difference because I would have used a round resist myself and cut the opening down the middle in a wave, Lyda suggested an oval resist with a wavy top edge and this proved to be an entirely better option. What it is to have artistic ability combined with years of experience! Carmen and Elaine worked on the various parts of their bags by rolling, pulling, stretching and spot fulling with a felting mouse. When the bags were almost finished they were rinsed thoroughly in clear water and then put to drain in my washing machine with a towel to add a bit of friction and weight. Doing this does not shrink the felt any further but it does remove a significiant amount of water and then you can work the felt further if you want or just stretch to shape and leave it to dry if you are happy that it is fulled enough. 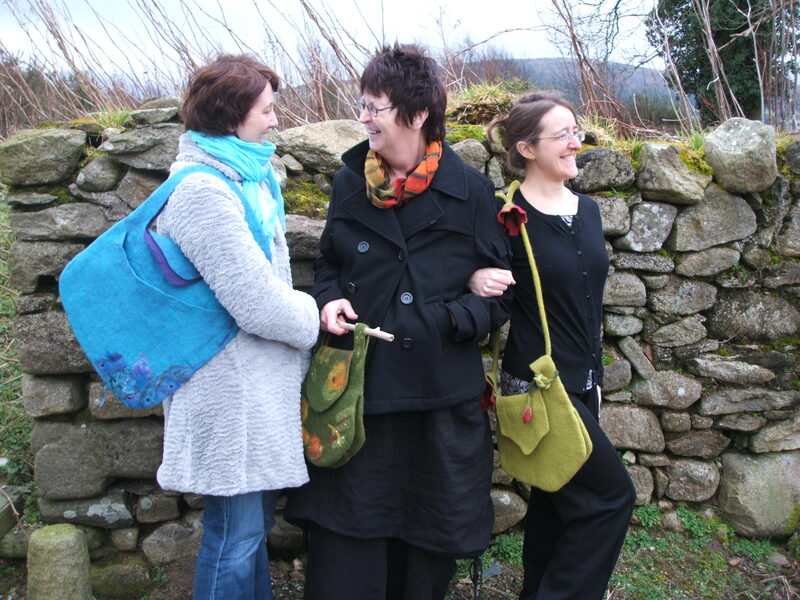 Elaine, Lyda and Cristina showing off the felt bags! I don’t have a picture yet of Carmen’s finished bag as she decided to do the final shaping at home and felt a beautiful scarf during the last hour or so of the afternoon. More about this in my next post and also some discussion about the various handle options when creating a felt bag. I would like to say a really big thank you all for leaving such lovely comments about my own complex bag! It is great to be able to feel so connected to everyone through the medium of the internet and I really appreciate you taking the time to leave your thoughts, tips and advice!! I’ll leave you with an image Lyda took as I was preparing my small vessel on the gravel for a photo, it gives a good overhead view of the scalloped edges of the opening. 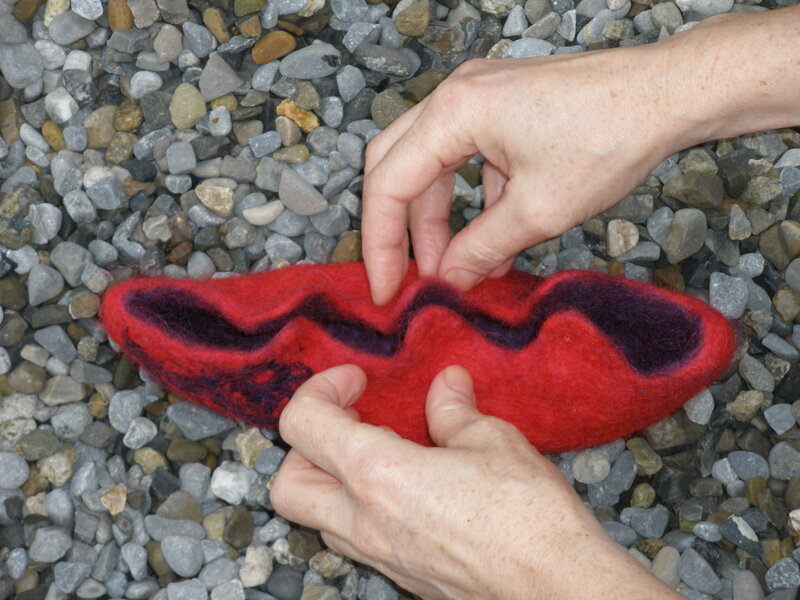 Exciting news, Lyda Rump felting workshops for February! 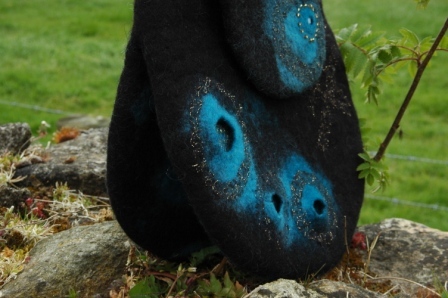 I am delighted to announce that Lyda Rump will be facilitating two seperate felting workshops here at Clasheen next February! Lyda is a fantastic textile artist who is gifted at passing on her experience. You may remember that I attended a brilliant workshop of hers at Felt in Focus last July where I learnt a lot about creating complex felt bags and ended up making a funky felt backpack. During the two day workshop Lyda shared many of her interesting bag designs with us utilising multiple resists and we also learnt simple techniques for incorporating and positioning inclusions such as glass beads accurately within out felt. Lyda loves including items from a treasure trove of silk, fibre, fabric and artificial glittery mesh into her bags and recently has been experimenting with new designs incorporating knitted or crocheted sections into the shoulder area. These newly designed bags remove a lot of the weight from the straps making them extremely well balanced and comfortable for anyone unable to carry heavy weights. When I tried on one of them in Denmark I was absolutely amazed at how light the bag felt, it was almost like wearing an item of clothing and not like carrying a heavy bag at all! Lyda has also recently designed a ‘scarf/sling’ as a stylish and wearable accessory for anyone recovering from various surgeries or needing a little extra support for their arm/upper body area, a totally neat idea. I also fell in love with different pieces of felt jewellery that Lyda had with her, especially a silk and felt necklace that Suzanne, one of the Irish contingent snapped up as soon as she saw it! Our first workshop ‘Felt Accessories’ will take place on Friday 5th February and the second, ”Complex Felt Bags or Backpacks’ will take place over two days, Saturday 6th and Sunday 7th February. These workshops are a brilliant opportunity to learn and have fun with a truly gifted tutor. To provisionally reserve your place please email me as soon as possible with your preference (full details will go up online over the next week or two), I guarantee you won’t be disappointed with the experience!